Rumor has it the planned main event for Survivor Series next month is Universal Champion Brock Lesnar against WWE World Heavyweight Champion Jinder Mahal. Oh dear. Dear oh dear. That’s…that’s quite a choice, isn’t it? In theory, this should be one of the biggest matches WWE can put on. The champion of Raw against the champion of Smackdown, on one of the biggest shows the company puts on all year. It beats the hell out ofwhen they’d putting the big champion vs. champion match on Raw with little to no build-up. And not even in the main event! But Brock Lesnar vs. Jinder Mahal isn’t exactly Clash of the Titans. Yes, they’ve strapped the rocket to Jinder. But his big matches against Randy Orton and Shinsuke Nakamura haven’t delivered, and his racially charged promos haven’t exactly inspired confidence. Having grown up a wrestling fan in the ’90s, I present you with this analogy. Imagine if they put the WWE Championship on Bob Holly in 1997, and then tried to market a major pay per view match pitting him against the Undertaker. The buzz is that it’s going to be a non-title match. So without the hook of a title possibly changing hands, what’s the draw here? I imagine it’s seeing Brock Lesnar beat the crap out of Jinder and the Singh Brothers. There’s also Paul Heyman’s promos in the build-up. 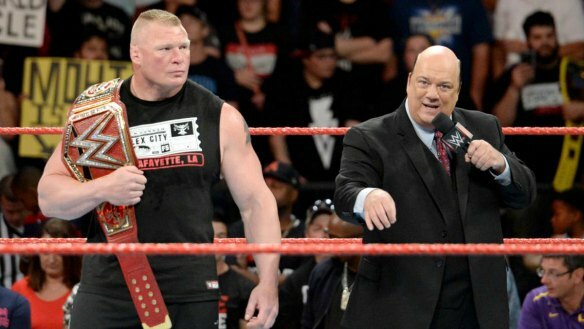 If anyone can put Jinder over as a legitimate threat to Brock Lesnar, it’s Heyman. Whenever they do these Raw vs. Smackdown matches, people always talk about how it could reflect badly on the loser’s brand. In this case, if Brock kills Jinder, how does that make Smackdown look compared to Raw? This kind of stuff gets overthought quite a bit. But given the perception of Smackdown as the B-show (even inside the walls of WWE, reportedly), some concern is merited. Could they have Brock take Jinder to Suplex City and beat him? Yes. But I don’t see that happening. Remember, Jinder is a Vince McMahon project. They’ve spent most of the year trying to get this guy over as their big Indian star. They’re making a big fuss out of him being the champion when they go to India in December. So it’s in their best interest to keep him looking relatively strong through the end of the year. Frankly, I don’t see why you’d book this match if not to benefit Jinder in some way. This match has “outside interference” and “screwjob finish” written all over it. You’ll have the Singh Brothers out there, you’ll have Heyman doing something. 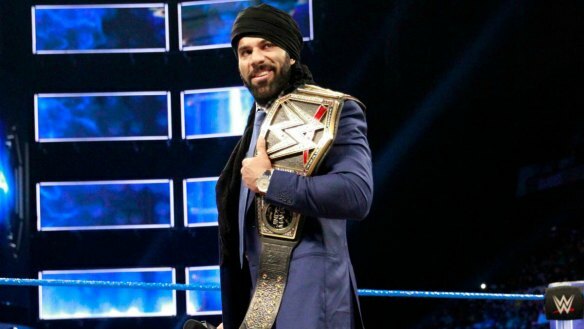 And Jinder’s next opponent (AJ Styles?) or Brock’s next opponent (Finn Balor?) could easily play a role in the finish somehow. It almost has to. That’s how you get out of this thing without Brock throwing Jinder around and making Smackdown look like the bush leagues. So who wins? Give it to Jinder by disqualification or count-out. That way Brock gets away without being pinned, and Jinder can technically say he beat the mighty Brock Lesnar. Jason Jordan, Apollo Crews, and Titus O’Neil def. Elias, Luke Gallows, and Karl Anderson. For some reason, that opening shot of Elias sitting with Gallows and Anderson was really funny. And a tribute to the Honky Tonk Man, of all people. Does that make Honky a good brother? Cedric Alexander def. Jack Gallagher. Solid match. I’m still getting used to heel Jack Gallagher. He definitely needs new music. I don’t think I’ll ever get tired of seeing Alexander hit the Lumbar Check. I can’t imagine what it’s like to take that. Braun Strowman appears on Miz TV. A stipulation is added to the Reigns/Stroman Steel Cage Match later in the night. So if Strowman wins, his team gets another partner at TLC. If Reigns wins, it goes back to three-on-three. A nice added hook for an already big match. All this team stuff has me in the mood for Survivor Series. So do you put the Shield on a traditional five-person team? Or do you give them their own match? Maybe a six-man elimination match? Sasha Banks def. Alicia Fox. Fox ambushes Banks afterward. Crazy Alicia Fox is entertaining. Campy, but entertaining nonetheless. I don’t know that it’s coincidence that WWE keeps bringing up Rey Mysterio Jr. They’ve mentioned him as one of Kalisto’s influences, they posted a brief video on Rey’s response to last week’s title win, and then they name dropped him again this week. It wouldn’t surprise me at all to hear they’re trying to court him for a return. Perhaps not a full time return. But they’d be foolish not to at least try for him. Dean Ambrose and Seth Rollins def. Cesaro and Sheamus to retain the Raw Tag Team Titles. With Ambrose and Rollins back in the Shield gear, there was a little extra sizzle on this one. But as gifted as these guys are, it’s still the same match we’ve seen a hundred times. It’s a good match. But the law of diminishing returns was in full effect here. Not a surprising finish here. Having the Shield take a big loss right before their big pay per view comeback wouldn’t make sense right now. Finn Balor announces the Demon is coming to meet Sister Abigail at TLC. Another week, another promo from Finn Balor. Worse yet, that awful Sister Abigail promo from last week apparently rubbed off on him, as they reached into their special effects bag again. Though at least the Demon character is somewhat cool. That Sister Abigail thing is another story entirely. They were teasing Curtis Axel as the fifth man for most of the show. So to prove himself, Axel gets goaded into picking a fight with Roman before the Cage Match. 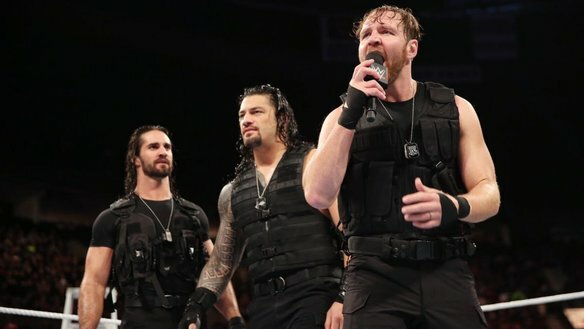 So instead of finding him alone, or maybe jumping him as he’s going to the ring, we see him walk up to all three members of the Shield backstage. Axel’s a good wrestler, but he might just be the dumbest henchman in television history. Then again, when Miz found him hanging upside down, one of the first things he asked was: “Who did this?? ?” So is one of them rubbing off on the other? This entry was posted in Wrestling and tagged Alexa Bliss, Alicia Fox, Apollo Crews, Ariya Daivari, Asuka, Bayley, Bob Holly, Braun Strowman, Brock Lesnar, Brock Lesnar vs. Jinder Mahal, Cedric Alexander, Cesaro, Curtis Axel, Dean Ambrose, Drew Gulak, Elias (WWE), Emma (WWE), Enzo Amore, Jack Gallagher, Jason Jordan, Jinder Mahal, Jinder Mahal WWE Champion, Kane (WWE), Karl Anderson, Luke Gallows, Mickie James, Miz TV, Mustafa Ali, Noam Dar, pro wrestling, professional wrestling, Rey Mysterio Jr., Roman Reigns, Sasha Banks, Seth Rollins, Sheamus, Shield reunion, Steel Cage Match, The Miz, The Shield (WWE), The Undertaker, Titus O'Neil, Tony Nese, Undertaker, WWE news, WWE Raw, WWE Raw results, WWE reviews, WWE rumors, WWE TLC, WWE TLC 2017 on 10/17/2017 by primaryignition.